Both providers and payers use data analytics to lower costs and improve care. 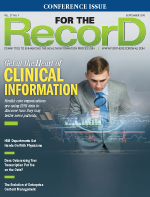 We all know that EHR implementation is a costly venture. The good news is that organizations are starting to see a return on investment in the form of data analytics. Unlike information stored in paper records, digital data can be manipulated and analyzed with the click of a button, providing insight into why patients get sick and how providers can prevent that from happening. However, improving patient care is only one of the drivers behind analytics. Value-based payment models have prompted providers to start thinking more about the quality and cost of care, says James H. Landman, JD, PhD, director of health care finance policy, perspectives, and analysis at the Healthcare Financial Management Association (HFMA). HFMA's Value Project, designed to help organizations thrive in a quality-driven health care environment, encourages the adoption of data analytics to collect, analyze, and connect accurate financial and quality data to support organizational decision-making. "Having this data allows you to continuously refine critical processes and build effective care pathways," Landman says. Integrated health care systems may have an easier time sharing and analyzing data across settings; however, even more disparate systems are starting to sync up and create workarounds so all entities can benefit from the information collected, Landman says. "HFMA has a number of systems which it uses that are getting into a global payment or shared-risk arrangement," he says. "They're being held responsible for the total spend per patient. This means they need to reach out and develop relationships with other providers so they can get data that they must continually monitor." This includes pulling data from postacute care settings, physician offices, and even retail clinics. Providers also are starting to pull lab data into their analytics, says Dennis Sweeney, MBA, a principal at Tellogic, which helps providers acquire, leverage, and analyze data to solve business problems and improve care. "You can now get access to these data and download them for analytics. This has been changing in the last couple of years," he says. Analyzing this data enhances a physician's ability to track disease progression, set up care coordination programs for patients with multiple chronic conditions, and even implement telehealth programs to monitor patients at home. Tellogic works primarily with large hospital systems, integrated delivery systems, and accountable care organizations. Sweeney says interest in analytics has increased tenfold since the company was founded in 2009. "The analytics piece is being used in every major academic medical center, and it's really starting to gain traction with the large practice associations and groups," says Laurance Stuntz, director of the Massachusetts eHealth Institute at MassTech, a quasi-public agency that provides statewide support for organizations adopting and using EHRs and health information exchanges (HIEs). "Here in Massachusetts, data analytics is a significant area of potential economic growth." Stuntz says more than one-half of the health plans in Massachusetts are moving to 100% value-based contracts or contracts with value-based components over the next two years. Accountable care organizations also continue to expand throughout the state. He says the increased interest in data analytics in Massachusetts could be partially due to two different legislative mandates that promote the use of HIT throughout the state. In August 2008, Chapter 305 of the Acts of 2008 provided $15 million in initial funding, a portion of which was used to create the Massachusetts eHealth Institute, which fostered statewide adoption of EHRs in all settings and established the statewide HIE now known as the Mass HIway. In August 2012, Chapter 224 of the Acts of 2012 created a first-in-the-nation requirement that providers both implement and use interoperable EHR technology to continue to practice in the Commonwealth. "This legislation gives us a specific focus, but the true business driver for analytics is really coming out of the payment reform—the change in payment methodology from fee-for-service to value-based care," Stuntz says. Some organizations aren't waiting for legislative mandates. Instead, they're taking matters into their own hands. For example, consider the University of Pittsburgh Medical Center (UPMC), which is part of the Pittsburgh Health Data Alliance (PHDA) along with the University of Pittsburgh and Carnegie Mellon University (CMU). The UPMC-funded PHDA launched in March to improve health care through the use of analytics. The alliance capitalizes on UPMC's fully functioning EHR, which serves as a source for robust data that are ripe for analytics. In addition, the PHDA makes use of comprehensive data derived from the UPMC Health Plan. "To have all of these data pieces work together through PHDA creates an innovative environment that is data-driven and patient-centric," says Michael J. Becich, MD, PhD, FACMI, chair of the department of biomedical informatics at the University of Pittsburgh. "Pitt and CMU are essentially the scientific force between the software and the algorithms, and obviously UPMC and UPMC Health Plan provide unprecedented access to their data to help innovate in this space." The alliance includes two research centers: the Center for Machine Learning and Health at CMU and the Center for Commercial Applications of Healthcare Data at the University of Pittsburgh. Becich, who serves as the director of Pitt's research center, says PHDA's two primary goals are to accelerate clinical research and improve patient care. A third goal is to license the technology that makes this type of analytics possible so that organizations nationwide can engage in similar innovation. How much will UPMC invest in the PHDA? With initial investments of $2 million per research center—and a $22 million pool from which longer-term projects will be funded—it's an expensive yet potentially game-changing initiative, Becich says. The initial investments will be provided annually for six years to fund short-term (three- to six-month) projects. As projects progress, UPMC will monitor them closely to determine which ones warrant longer-term investment. Becich says Pitt's research center has proposed six potential projects for consideration during the first round of funding. One project pertains to medication adherence. "We'll use an algorithm to assess the risk level and then target evidence-based interventions provided at the point of care," he says. Such interventions may include patient education about when and how to take medications as well as which drugs can or cannot be taken together. Interventions may also include alerts and reminders via mobile devices. Another project aims to reduce pathology errors. "Cancer can hide from the pathologist because of something called heterogeneity within the tumor," Becich says. "This is what causes the error rate. It's not really an error rate because they do the best with what they've sampled, but there are deeper signals within the tumor that computer vision can help to dissect." By quantifying tumor data through analytics, providers can render more accurate diagnoses and make more informed treatment decisions. Preventing patient falls in nursing homes is the focus of a third project. Using patient clinical and medication data from UPMC's EHR, researchers hope to apply analytics to identify patients who are at risk of falling. The project relies on data such as diagnoses (eg, neurological disorders, heart disease, or cancer) as well as side effects from medications used to treat those conditions. When combined, researchers can make inferences from this information and notify providers when proactive measures are necessary. "There's a lot of data generated for these patients that can help us predict when fall risk is on the rise," Becich says. "Sometimes the care interventions we give have downstream effects, and what we want is the data to talk louder. To get that data to talk louder, we need the algorithms and software." All data have a story to tell. Ideally, that tale will be told at the point of care, says Michael Rothman, PhD, cofounder and chief science officer at PeraHealth, which uses hospital EHR data to derive a patient severity score, termed a Rothman Index (RI) score, that gives providers immediate insight into a patient's condition at any given time. "Every time a new piece of information is entered into the EHR, we recalculate that score and show a graph of that score over time. This allows you to see whether a patient is getting better, deteriorating, or just staying the same," Rothman says. The RI score, which is based on data feeds from 50 different sources, including vital signs, lab results, and nursing assessments, aids in patient surveillance as well as communication between providers as work shifts change. The score is gleaned by looking at a graph embedded into the EHR or displayed on a wide-screen monitor at various nursing stations. Graphs are color-coded depending on a patient's condition and, in some cases, the ICU-attending physician or charge nurse receives an alert when certain data points change. "You're looking at thousands of pages of medical information at a glance," Rothman says, adding that this type of continual monitoring isn't possible without analytics technology and advancements. Rothman says a variety of providers, including large academic medical centers, children's hospitals, small and large community hospitals, and specialty facilities, are currently using the RI score to improve care. Reducing readmissions is a common application. The lower a patient's RI score, the sicker the patient. The idea behind reducing readmissions is that patients with lower RI scores upon discharge have a greater likelihood of being readmitted. Staff members can target this population to ensure the necessary social and medical support is available upon discharge. The RI score also helps establish the timing of discharges. A study of RI use in 11 nursing units at Houston Methodist Hospital showed a 25% reduction of risk-adjusted mortality and a 16% drop in unplanned ICU transfers. And in just one month, Houston Methodist used the RI to identify 25 patients with deterioration so subtle that doctors or nurses didn't recognize it. Rothman anticipates the RI score may gain attention from payers as medical necessity audits continue. "You can imagine the insurance company saying, 'The score was 75. Why didn't you discharge the patient yesterday?' It will force physicians to really document thoroughly," he says. Rothman anticipates the RI score branching out into population health management. "I can imagine this as a universal patient score—something that follows patients from cradle to grave," he says. "Your primary care physician would check your score at your annual physical or if you had a chronic disease, and then he or she would use it to monitor you." Payers may not be currently using real-time analytics, but they are definitely tapping into the power of Big Data. In fact, payers have been on the analytics bandwagon for quite some time, says Emily Washington, director of business operations at Infogix, a software vendor that provides payers with automated data integrity controls to monitor data movement, ensure accurate processing, and reduce duplication. "[All payers] are being flooded with data from different channels, whether it's from the providers or the members directly," she says. "Everyone is doing some type of analytics." Washington says all of Infogix's clients are interested in analytics, though their focus has shifted in recent years due to the Affordable Care Act and emerging value-based payment models. More specifically, payer analytics are becoming far more complex and predictive in nature, says Julie Skeen, a health care strategy and operations manager at Infogix. Payers want to segment members into personas and profiles that may or may not require interventions. Payers then alert providers or notify members directly to mitigate risk. Skeen says payers are increasingly interested in using data analytics to help providers, particularly primary care physicians, identify gaps in patient care. Payers can accomplish this because, unlike providers, they're privy to claims data from various settings. For example, a payer can easily identify patients with diabetes who haven't had an A1c test in six months or those with a chronic condition who haven't refilled their prescriptions. These patients likely require follow-up on the part of the provider. "Payers want to be a partner with the providers and do the best they can to have a healthier population. This only benefits everyone. They also want to retain their members and keep them engaged," Skeen says. Payers face a serious challenge in that they depend on data from providers, Washington says. Although they have exposure to claims data, they don't always have easy access to the more in-depth medical record information—including historical data—that captures a patient's entire story. Another challenge is that payers don't always have the in-house expertise to interpret the data and translate them into actionable results. Data integrity is also a challenge, Skeen says. "This really becomes a problem as you start to pull in more and more data sets," she says. Washington and Skeen agree that many payers haven't delved into the data analytics possibilities of ICD-10, but that it's only a matter of time before they do. Stuntz says providers also will try to take advantage of the specificity inherent in ICD-10. "The additional specificity has the potential to have an impact on the ability of data analytics to further identify patients and cohorts and make computerized inferences in terms of the treatments that will be most successful," he says. "But it will definitely take a long time to roll out because it will take a while to get the coding to be consistent and all the data to be updated." Landman agrees. "In the long term, the greater granularity of the data will be helpful for analytics," he says. "The biggest concern right now is just getting over the implementation." However, ICD-10—as well as any additional integration of hospital and pharmacy data—will continue to lay an important foundation for population health management, Landman says. "One advantage that a retail clinic has over a health system is that not only are people coming in for primary care visits or to fill a script, but they're also buying things," he says. "So you can get a sense of some of their behavioral patterns based on the other purchases they're making. From a population health perspective, this is really valuable data." As with anything in health care, it's about the process, Stuntz says. "First, the data must be digital. Then, you have to share the data. Then you have to have the opportunity to use it and make a real impact on health care," he says. "We're right at the beginning of that, and it's really exciting."